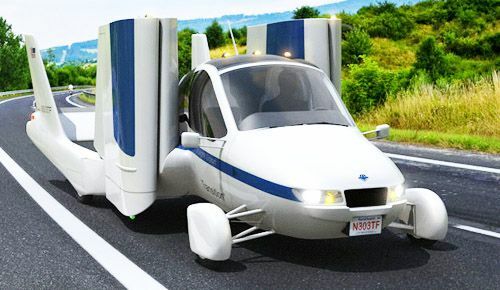 Terrafugia's flying car can be parked in your garage, driven to the airport, spread its 20-ft. wingspan, and with proper clearance, climb into the wild blue yonder. Developed by a cadre of aeronautical engineering grads from MIT, the Terrafugia flying car has been a work in progress since 2006. There production prototype, The Transition Roadable Aircraft, will make its public debut to predictable interest at the 2012 New York International Auto Show. The governmental and industrial safety tests a new car is required to pass are considerable. To produce a vehicle that can pass not only automotive criteria, but make it through the Federal Aviation Administration’s trials and tests as well is an engineering and fabrication accomplishment of Herculean proportions. The flying car could be considered one of the first real world Transformers in its functioning dual role. The Transition prototype will be revealed along with information on Terrafugia’s plans for the future. They already have 100 orders for the winged automobile on the books. The public will be able to see the flying car up close along with wing folding and unfolding demonstrations. Videos of the Transition in flight will herald the future of personal transportation in this ever-changing world. Terrafugia is based in Woburn, MA and was founded by pilots and engineers supported by an elite network of advisors and private investors. The name comes from a Latin phrase meaning “escape the earth.” Terrafugia seeks to deliver revolutionary, yet practical air and land vehicles engendering freedom, flexibility and fun. The FAA classifies the Transition flying car as a Light Sport Aircraft. For more information on Terrafugia, click here.